May 10 - German master Conrad Schumacher was in New England for several clinics. May 4-6, he shared his thoughts with riders and auditors at the premier dressage facility operated by Nancy Later Lavoie in Ashby. The clinic was geared towards Junior Riders, but as most were in school on Friday there was an opportunity for the adult amateurs and professionals to ride with Mr. Schumacher. All levels of horses and riders were present from ponies to a Brentina Cup rider. 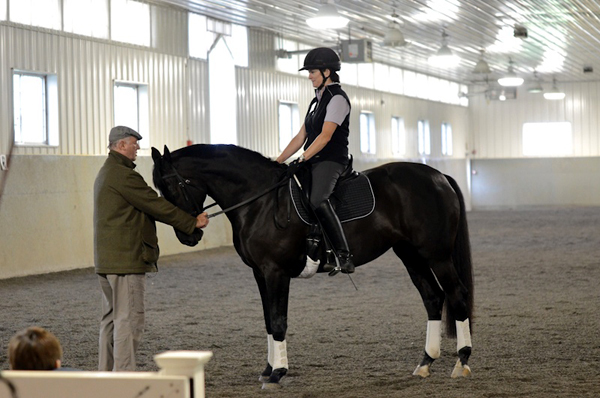 Nancy Later Lavoie, who runs Carousel Dressage Horses in Massachusetts at Ashby Stock Farm four months out of the year and Heartwood Farm in Loxahatchee Groves, Florida for the remaining period, has trained with Mr. Schumacher before. He held three week-long clinics at three different barns in Florida. Nancy really enjoys his handle on the basics and clarity with which he teaches balance and thoroughness in a compassionate way. “The horses are most important and he really gets the horse working with the rider,” she says. The day started at 8:00 AM sharp and included 9 riders who rode for 45 minutes each. The first thing Mr. Schumacher asked the rider was what their “plan for the day” was. If the student wasn't sure, he would ask which movements the rider received the lowest scores on at a show. This would bring to light where the horse or rider needed improvement. Many of the riders wanted help with the flying changes. To get a better idea of how to help the particular student, he would let him or her warm-up their horse and show a flying change. This allowed Mr. Schumacher to draw up a plan appropriate to rider and horse to help them achieve their goals. Many trainers and instructors agree that transitions are very valuable for many different reasons, but during clinics they aren’t always shown. Mr. Schumacher, however, had his students do lots of them. The first rider of the clinic, Lisa Cross, rode a 4-year old horse. Transitions helped the young mare listen to the aids in a relaxed manner. Lisa was asked to make downward transitions with her seat and less with her hands. As the horse started to understand, she became more relaxed in the hand. When she was happy and warmed-up, the mare's canter had improved significantly and she moved in a much more relaxed frame. Gayle Paquin, a licensed dressage professional, rode her 11-year old AWS gelding. She wanted help with the flying changes, so Mr. Schumacher watched her warm up her 17.3 hand horse and had her ride him in a more vertical frame. Gayle had been riding with Mr. Schumacher before and he was very much impressed with how much they had improved. They started working on the half passes and Mr. Schumacher demanded she rode very precise along the line of travel in a steady frame. Again, lots of transitions were used, this time to get the horse more active from behind. Mary Ann Grant had ridden with Mr. Schumacher before and wanted help with the flying changes as well. She is a gold medalist and brought her 2004 Hanoverian mare. They worked on straightness, transitions and shoulder in. At the end of her lesson, the horse had really come alive and reactive with a beautiful elevated trot. Mr. Schumacher explained that these exercises would help prepare her for the flying changes. But the 45 minutes were up and the next rider came into the ring. The fourth student worked with Mr. Schumacher on increasing the swing in her mare's back. This would enable her to step under herself better. Susan Mercer had to ride her 9-year old Hanoverian over poles in the right tempo and in the right frame to accomplish this. Susan took advantage of Mr. Schumacher's teachings by signing up for more than one clinic so this gave them the opportunity to really build on what they learned each day. The last horse before the lunch break was an 11-year old Trakehner gelding ridden by Shan Lawton. He too requested help with the flying changes. They cantered over the poles to make him less excited about the jump.